Established in Busto Arsizio, Italy, in 1952, the Giovanni RABOLINI SRL Company has specialized, from the beginning in the design and production of quality platen die-cutters, becoming leader of the paperboard converting machines field. 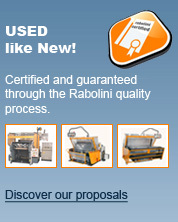 RABOLINI, IT’S THE NAME THAT MAKES THE DIFFERENCE. Competent personnel assistance also is given on the phone, to suggest, where possible, the controls and the necessary operations for a fast machine starting . The machine is produced to the higher standard possible as made in solid and compact cast iron construction with many reinforcement ribs; the drive shafts, guides, connecting rods and cam in steel, adding up best quality and excellent resistance to the cutting pressures. 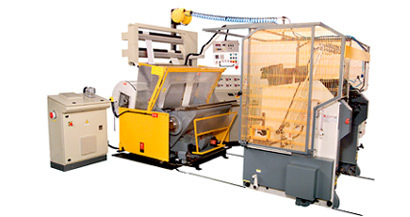 The efficient automatic lubrication, the quality of the materials, accurate machining of the components that have been heat-treated, as well as the generous dimensions of the various mechanical parts, such as mountings, shafts, helical or bi-helical tooth gears, sectors and flat guides, cams and rollers, make the IMPERIA cutting and creasing platen die-cutter particularly resistant to every day stress and wear.